and a deep appreciation for art, design and craftsmanship. 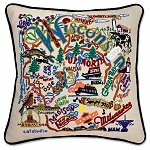 ode to Geography and craftsmanship - the created the catstudo geography pillow. (on the care label) Some have as many as 30 different colors! Learn more about catstudio and the Geography collection. Wow! From the Mississippi River to Lake Superior & Lake Michigan - this original design celebrates the beautiful State of Wisconsin! Celebrate the states! These pillows from Catstudio's Geography Collection are delightful keepsakes for remembering the hometown you grew up in or commemorating your favorite vacation spot. Embroidered entirely by hand (over 35 hours go into each one!) with black velvet piping, these make the perfect gift for all occasions! Removable cotton cover and poly-fill pillow form. Cover is dry clean only. 19 inch square and very plush! Also available in a 30 inch Over-sized version! Click on the pillow image to enlarge and see all the detail. Click here to view the reverse side. 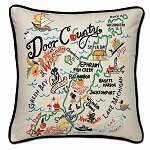 Cape Cod of the Midwest - this original design celebrates Door County with beautiful detail. Celebrate the states! These pillows from Catstudio's Geography Collection are delightful keepsakes for remembering the hometown you grew up in or commemorating your favorite vacation spot. Embroidered entirely by hand (over 35 hours go into each one!) with black velvet piping, these make the perfect gift for all occasions! Removable cotton cover and poly-fill pillow form. Cover is dry clean only. 19" square and very plush! Click on the pillow image to enlarge and see all the detail. Click here to view the reverse side. 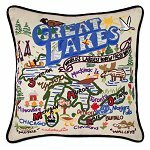 This original design celebrates the Great Lakes....the world's largest body of fresh water! From Duluth, Minnesota to Niagara Falls... Canada to Cleveland, Ohio. Celebrate the states! These pillows from Catstudio's Geography Collection are delightful keepsakes for remembering the hometown you grew up in or commemorating your favorite vacation spot. Embroidered entirely by hand (over 35 hours go into each one!) with black velvet piping, these make the perfect gift for all occasions! Removable cotton cover and poly-fill pillow form. Cover is dry clean only. 19" square and very plush! Click on the pillow image to enlarge and see all the detail. Click here to view the reverse side. 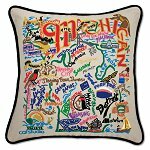 This original design celebrates the amazing State of Michigan in great detail - from Battle Creek to Holland (yes they have Tulips) to the Porcupine Mountains!!! Celebrate the states! These pillows from Catstudio's Geography Collection are delightful keepsakes for remembering the hometown you grew up in or commemorating your favorite vacation spot. Embroidered entirely by hand (over 35 hours go into each one!) with black velvet piping, these make the perfect gift for all occasions! Removable cotton cover and poly-fill pillow form. Cover is dry clean only. 19" square and very plush! Click on the pillow image to enlarge and see all the detail. Click here to view the reverse side.